By Abdul Halim, M. A.
Baz Bahadur, the last Afghan king of the kingdom of Malwa, was the son of Shuja’t Khan, who, on the restora­tion of Humayun, had declared his independence. On Shuja’t Khan’s death in 1554-55, his kingdom became divided between his three sons, Dawlat Khan, Bayazid Khan and Mustafa Khan. Bayazid killed Dawlat Khan following a treacherous attack and added Ujjain and Mandu to his territories and assumed the title of Baz Bahadur Khan. But when he attacked Mustafa Khan who ruled over Bhilsa and Raisian and chased the prince to Gondwana, Baz Bahadur sustained a severe defeat at the hands of Rani Durgavati, the regent of the kingdom, ruling it on behalf of her son, prince Viranarayan. Baz Bahadur reached Sarangpur, his capital, badly wounded, and leaving his baggage, men and ensign in the hands of the enemy. Since then he immersed himself in pursuits of pleasure, and enjoyed his time in the midst of songstresses and dancing girls, the chiefest of whom was Rupmati. The latter was a Hindu girl of rare charm and beauty, sweetness and grace in conversation, a poetess of Persian and Hindi, a faultless reciter, composer and singer. He loved Rupmati and Rupmati loved him and the pair, according to Firishta, never separated at any time of day or night. Rupmati has been described by contemporaries as a Padmini, highest and the most perfect type of women remarkable for their beauty, good disposition, height, well­-proportioned physique, softness of speech, grace and chastity and devotion to her lord. Baz Bahadur soon lost his grip over the administration; the army became demoralised and nobles corrupt. This state of affairs encouraged Akbar, then a youth, to send a formidable army under Adham Khan, Atka and Pir Muhammad Khan Shirwani in 1560. Baz Bahadur came to defend his capital when the Mughals had appeared within two miles of the defences erected by him outside Saranapur. He fought, got defeated and fled ‘disgrace being his only companion’, leaving his camp and harem in the hands of enemies. Baz Bahadur’s men struck Rupmati and a few others with sword according to instructions in order to save them from disgrace following capture. Believing they were dead, they went to the palace to kill the rest. Meanwhile the Mughals had entered the city and the ladies were running for shelter and the executioners took to their heels. On entering the palace Adham Khan who had captured the hiding ladies, made enquiries about Rupmati and was informed that she was still alive. Instructing his men to take proper care of the wounded, he sent words to Rupmati assuring her that, on her recovery she would be sent to her husband. On this Rupmati sent the following couplet in Persian as token of her gratitude. Adham Khan who had other designs, postponed her departure saying that Baz Bahadur must first submit to the emperor. One night, he having sent his men to bring Rupmati to his quarters was told by her that she would go if the Khan came. When Adham Khan came and approached her cot, he found her sleeping the slumber of death, decked in her jewels and garland of flowers, and perfumes heavily smeared. On enquiry, he was told that after sending back Adham Khan’s messengers, she wept bitterly in memory of her husband and swallowed camphor mixed with sesame oil. Admiring her fidelity to her husband he ordered for burial. Not long after, Adham Khan was relieved of the governorship of Malwa and superseded by Pir Muhammad Khan Shirwani. Baz Bahadur invaded Malwa with the assistance of Miran Mubarak Shah, ruler of Khandesh. He defeated Pir Muhammad Khan who lost his life in retreat by being drowned in the waters of the Narbada. Baz Bahadur retained Malwa for some months till his ejection by Abdullah Khan Uzbak, Akbar’s new governor (970/1561-62). Baz Bahadur who fled Malwa a second time without an encounter, roamed for sometime in the forests and hills, went to various chiefs in Gujrat, to Burhan-ul-Mulk, ruler of Ahmadnagar and to Rana Udaisimh of Mewar. But unable to move any court on his behalf, he submitted to Akbar and was enlisted as a mansabdar of 1000 troopers and later on of 2000 zat and 2000 Sawar. Baz Bahadur has been described by contemporary historians as being a skilful rider, an archer and a polo player. He was a zealous builder as well, whose palace and the pavilion of his consort can still be seen among the ruins of Mandu. Not much is known about Baz Bahadur’s contribution to music except the information that he was a master in Hindustani music. He has been placed by posterity in the rank of a Gandharv, that is one who was well conversant with the practical music of his own and the past times. He is listed by Abul Fazl as a top musician of Akbar’s court, and was perhaps considered next to Tansen, Baba Ramdas and Nayak Charju and sang in a style of his own which became known, according to Abul Fazl, as the Bazkhani ; He should have been considered as the representative of the Dhrupad school of singing of which Raja Man of Gwalior was the founder. But being a prince, born and brought up in north , he can be regarded as being conversant with the Khiyal school of music, of which Husain Shah Sharqi, king of Jawnpur was the greatest exponent in the recent past. In the collection of songs attributed to him in the Encyclopaedia of Music, there are a few dohas, two lined verses, corresponding to Sthai and Antara of Khiyal, sung in Dhima Tintal, a time beat not allowed in Dhrupad. It may be conjectured that the Bazkhani style was a mixture of Dhrupad and the Muslim style of music corresponding to Khiyal. Baz Bahadur was an expert dancer and I have literary evidences to prove that he danced with the anklets of pearls instead of the ordinary ones of brass, and he danced in the company of his dancers imagining himself Krishna sporting with the Gopis, of whom the principal one was his lady love. Rupmati, occupying the position of Radha. The themes of Baz Bahadur’s extant songs are Krishna’s sports in Vrindaban, the sprinkling of coloured water in the spring festival, at least one song invoking the assistance of God, a very natural thing from a man who had suddenly stepped from the throne into tire abyss of misfortune, but none bearing a melancholy strain, and none carrying any reference to his lady love, Rupmati. The style of Baz Bahadur’s composition is simple and the diction corresponds to the easy Khari dialect of Delhi and Mirut. Rupmati wrote in chaste, elegant and learned Braj. A collection of her verses in a translated form has been prepared by Mr. L. M. Crump, under the title of ‘The lady of the Lotus’ Oxford, 1926). I have collected four Hindi songs from the Encyclopaedia of Indian music. In most of the poems bearing her pen­name she appears as one who sees her husband in sleep and wakefulness, one who has surrendered herself completely to her lord and thinks of the futility of writing letters to him because he always dwells in her heart. She represents the highest virtues of a woman in an oriental society. The poems she is supposed to have composed in captivity are full of pathos. The following are two of Baz Bahadur’s compositions. The couple sprinkles coloured water in the palace, the beauty of which scene cannot be described. Abandoning modesty they are clasping body, with body, both intoxicated with mirth. Baz Bahadur celebrates the spring festival merrily. This evidently applies to Baz Bahadur, because Krishna never played holi in a palace. The following pad, in Rag Bhairawn, is an invocation to God. Jo jo tohe takabay, man ichha phal pabay. Oh Creator, I have made thee my judge . Thou easest my hardships;. Whoever looks to thee,. thou fulfillest his desire. Thou art the bestower of happiness to all the virtuous. O Baz Bahadur, the Refuge of the virtuous, keeps. everybody's respects. The following are a few of Rupmati’s songs expressive of her sense of sorrow at separation from her lord under con­dition of captivity. When the papar flowers sprout their buds;. Baz Bahadur decked with pearls at his feet. Showered jewels on and on;.I pine till death for the good sight of my lover ;. Now he roams proudly, and is unconsoled . My loved one, for thy own sake ;. Forget the separation of Rupmati. She is prepared to seek refuge in every affliction. The following is a quotation from L. M. Crump’s “The Lady of the Lotus”. Thou art the whole life to me. And separation from the death. Only the memory of thy face Keeps in me in breath. There are many love stories like those of Laila-Majnun, Yusuf-Zulaikha and Shiri-Farhad on which writers and artists have employed their craft and ingenuity for centuries but nothing surpasses the story of romantic love between a man and a woman within living memory, as between Baz Bahadur and Rupmati. 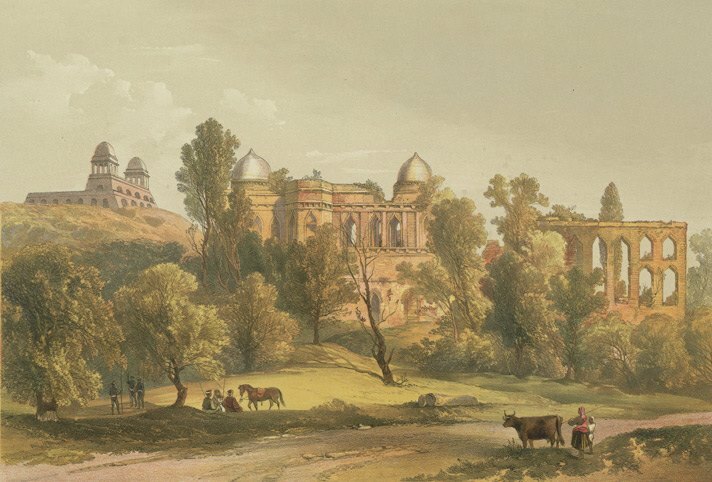 The Palace of Sultan Baz Bahadur, by Claudius R.W.F Harris, 1859.